The UK Independence Party will be hoping that it is not a victim of its own success at the 2017 election. With a vote to leave the European Union achieved, some are questioning whether the party has lost its raison d’être. The party was established in 1991 in the wake of the recently-signed Maastricht Treaty, which promised greater integration between European Union member states. From the beginning the one key priority was to campaign to leave the EU. It first adopted the UKIP name in 1993, specifically to avoid confusion with the far-right British National Party: UKIP has always been keen to stress it is not a racist organisation. The dominant figure in its growth is Nigel Farage, who served two long spells as leader. In the elections for the European Parliament held in 1994 the party captured just 1% of the vote, in 2014 it came top with 27.5% of the vote, getting 24 MEPs elected. UKIP felt short-changed at the 2015 election. The party secured almost 3.9m votes, and 12.6% of the popular vote, putting it third behind the Conservatives and Labour, and ahead of the Liberal Democrats, but returned just one MP, Douglas Carswell, who successfully defended his seat in Clacton. The party’s only other MP – the Conservative defector, Mark Reckless, lost his Rochester and Strood seat to the Conservatives. Meanwhile, party leader Farage resigned after failing to win in Thanet South, only to return when the party refused to accept it. Farage finally stood down in July 2016 following a successful campaign in the EU referendum, and the baton passed to Diane James, but she lasted just 18 days in the role. The current leader is Paul Nuttall, who has been in charge since November. UKIP had around 39,000 members, as of July 2016. As the still fairly new party leader Paul Nuttall is the face of the election campaign. However, he made a rocky start as a leader, with a troubled campaign to win Stoke Central in a by-election earlier this year. A very poor performance in May’s local elections was another set back. All 145 UKIP councillors defending their seats were beaten, although the party did pick up one seat in Burnley. However, he has remained bullish, and predicted that voters will return to the party in the future if Theresa May “backslides” over Brexit negotiations. Nuttall was seen as someone who could continue to gain UKIP votes from traditional Labour heartlands but critics say he has shifted the party to the right in what would be a departure from Nigel Farage’s stated policy of appealing to disaffected voters from across the political spectrum. Many people expect the former leader Farage to re-emerge as a leading figure during the campaign, but he has adopted a relatively low profile so far, even appearing to admit that UKIP’s future might be in doubt if Mrs May delivers a “hard Brexit” in two years’ time. Former MP Carswell, who quit the party to sit as an independent, has also been sniping from the sidelines. “If we use the analogy of UKIP as a racing car, Nigel (Farage) was a skilled driver who drove the car around the track faster and faster, knowing when to take risks, delighting the audience. The current leadership has crashed the car, at the first bend of the race, into the crowd, killing the driver and spectators.” Arron Banks, former UKIP donor. UKIP will hope that their vote isn’t too badly squeezed at the election. Following the dismal showing the the local elections, many believe that large chunks of the party’s support could, with Mrs May promising “hard” Brexit, transfer to the Conservatives. 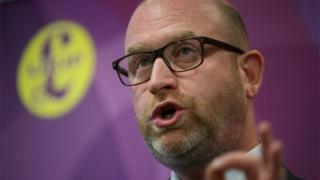 Nuttall has said he expects the UKIP vote to go down – but said the party was “targeting sensibly” in certain seats. The party has also decided not to stand in some constituencies where a pro-Brexit candidate from another party has a good chance of winning. Consistency of approach on Brexit. The party can point to the fact that Mrs May actually voted to remain in the European Union, before pledging to deliver Brexit. They are the true believers who could never be accused of political expediency. No compromise. The party wants the UK to make a clean break from the European Union. Cut net migration levels to zero within five years by almost halving immigration into the UK. Unskilled and low-skilled labour banned for five years, and skilled workers and students would need visas. A freeze on the opening of new Muslim schools until more progress has been made integrating Muslims into mainstream society. Postal voting on demand to be scrapped, with applicants having to demonstrate a genuine need before a postal vote is granted. ← What's in a brand?